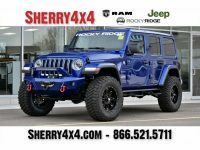 Among the many vehicles that you will find for sale at Sherry Chrysler is the Jeep Wrangler. 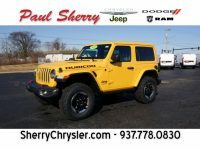 The Wrangler has a rich history of being a popular and capable SUV that appeals to families, off-roaders, those who want space for cargo, and a range of other people throughout Ohio. 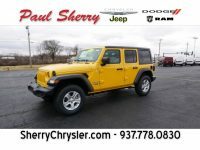 Take a closer look at the past and current Jeep Wrangler models to gain a better appreciation for the SUV you will find at your local dealership. The current Jeep Wrangler available in Ohio is the JL. There are five trim levels to choose from and a range of engine choices, including a 2.0-liter direct-injection turbocharged engine with 295 pound-feet. Or you can go with the 3.6-liter Pentastar V6 for 285 horsepower. Every single model of the new Jeep Wrangler is Trail Rated, meaning that it can handle off-road adventures with ease. To earn this badge, the Wrangler had to prove itself in terms of traction, articulation, ground clearance, water fording, and maneuverability. To help with off-roading, the Wrangler offers features like the Selec-Trac 4×4 System, Command-Trac, Rock-Trac, and Hill Descent Control. 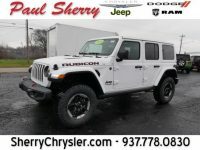 The latest Wranglers for sale in Ohio maintain the option to remove the roof and windows to get plenty of fresh air, but with modern improvements. For example, there is a Sky One-Touch Power Top available now, complete with automatic functionality. You also get an updated interior, complete with a leather-wrapped dashboard and the Uconnect 4C NAV infotainment system. This includes an 8.4-inch touch screen and plenty of connectivity. 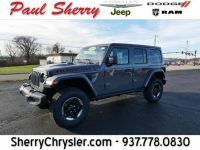 When it comes time to buy your new Jeep Wrangler, head to Sherry Chrysler. Our team is your top choice in Ohio for Jeep Wranglers, thanks to our excellent customer service and extensive selection. 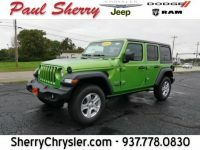 We always have a range of new and used models available, including the latest Jeep Wrangler. With our wide selection, you can choose the trim level you prefer and pick details like color and engine. Our goal is to ensure that you drive off of our lot fully satisfied with your purchase. 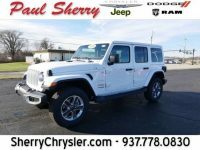 Visit our dealership to take the new Jeep Wrangler on a test drive around Piqua, Ohio. 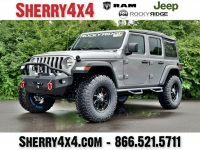 Or just browse our online inventory to read about and see photos of the Wrangler. We would also love to talk to you via online chat or over the phone to answer any questions you have. The history of the Jeep Wrangler actually goes back all the way to the Willys MB in 1941. The name Wrangler first appeared for the 1987 model year, replacing the Jeep CJ. Despite this, the Wrangler’s roots are clearly in Willys-Overland that had a contract with the United States military to create a four-wheel-drive auto for war. The vehicle’s official name was the MB although it quickly became known as the Jeep. Following the war, the Willys-Overland CJ replaced the MB from 1945 to 1954. The CJ-2A almost immediately gained a reputation for being nearly impossible to break, simple to repair, and incredibly reliable. From there, Willys-Overland made the CJ-3A, CJ-3B, and CJ-5, the latter being in production from 1954 to 1983. Throughout this time, there were several variations, and this was the result of Kaiser Motors buying Willys-Overland. This generation is when the name Jeep became official. The CJ-5 even continued when American Motors Corporation bought Kaiser-Jeep in 1970. From 1976 to 1986, drivers enjoyed the Jeep CJ-7, which was bigger and had better on-road manners. There were also newly optional features like metal doors, a roof, and an automatic transmission. The Wrangler name arrived in 1987 with the Wrangler YJ, lasting until 1995. The YJ had a bigger windshield, lower ride height, wider track, and reduced body roll for a better on-road ride. The Wrangler TJ arrived in 1997 and continued until 2006. This generation stood out with its coil-spring suspension and round headlights. The Wrangler JK was the next generation, going from 2007 to 2018 with more safety features and the first four-door version available.